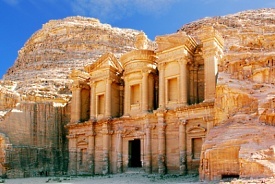 Named for the Greek word meaning "rock," Petra was a flourishing trade center in ancient times and is now a UNESCO World Heritage Site. Explore on foot or horseback the 2,000-year-old structures built into soaring salmon-pink sandstone. The Nabataeans, the civilization that built Petra, also were expert hydraulic engineers, as evidenced by channels carved into the rock that prevented flood damage and helped store water during droughts. Archaeologists from all over the world continue to excavate the Hellenistic temples, tombs and theaters, as only one percent of the city is believed to have been "discovered." Aqaba -- Jordan's Red Sea port and resort town -- boasts ancient sites as well as spectacular coral reefs.